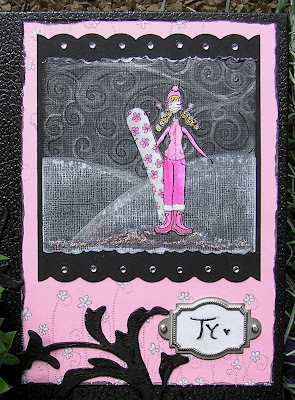 Tim Holtz's grunge board is fun to work with. I slathered it in some of his Distress Crackle Paint (black soot) and added it to this Sketchbook. (I'm starting early on my Christmas presents this year, because I'm givin' all handmade gifts.) This is a sketchbook for my sweet little sister Tyese (aka weasel seester). She's not so little anymore, but she's every but as sweet! I've never stepped on a snowboard, but she has and she lives in a resort town, so I thought Daisyboardabella would be cute. She likes to make lists (she's the most organized gal I know) and she's artistic, so I thought a sketchbook would be a good place for her to save schtuff. If you'd like to pledge too, you can do so here. One Christmas, years ago, my Mom's side of the family all decided that we were going to only give each other what we had made with our hands. (I've talked about this on here before, but the memory makes me so happy that I couldn't resist sharing it again.) Those gifts are my most treasured possessions. I find the edges of the grunge board hard to hit with the paint, but a black marker around the edges solves that problem. Messy little paws I have, hey? I don't know how that cracklyfabulousness happens, but me likey! You just brush it on and let it dry. If you want big cracks apply a thick coat; if you want finer cracks apply a thinner coat. You can blend colours too. The bottle says it's best to dry it naturally, but you can start it off with a bit of gentle heatgunning. A sketchbook is a great 3D gift for beginners to start with because it's just as easy as making a card. I just stuck this card-like image on with good double-sided tape. Then glued the grunge board on with crystal effects & double-sided tape. Ouuu and this is by ranger too Crackle accents (it's clear) gots ta get me some of that! Isn't Deborah's project gorgeous? Everything is splendiferous. Especially love the snow scene you made. Did I ever tell you are talented? Why that's a cool idea! I like the handmade gift idea. There's a Vinyl Cafe\Stuart McLean sketch about Sam & Morley et all making Christmas gifts for each other. You should try to find the podcast. It's a good one. What if your sister checks out your blog???? Then you're in trouble! OH, this is WAY cool! I love your pictorials--looks like you had a fun time making a mess, hehe! I love grungeboard and your technique is awesome! Bella looks totally great with this sketch too! FAbulous work! hugs! What a great family you have to do that for each other, so much more personnal than buying a gift.As usual your work rocks. Super cool sketch book, Mel! I love it and your sister is gonna be thrilled when she opens this gift! Fantastic!!! By the way, tag, you're it!!!! and I'm running out of AWE words!! so once again my friend.. this is INCREDIBLE! another great creation here. HUMMMMM, is there no end to your ideas woman? Great idea going handmade, my friend Dianne gives out handmade items for every occation (a very talented lady) and I love all her gifts.